« Get 20 Crystal Stud Earrings for $1.55 SHIPPED! 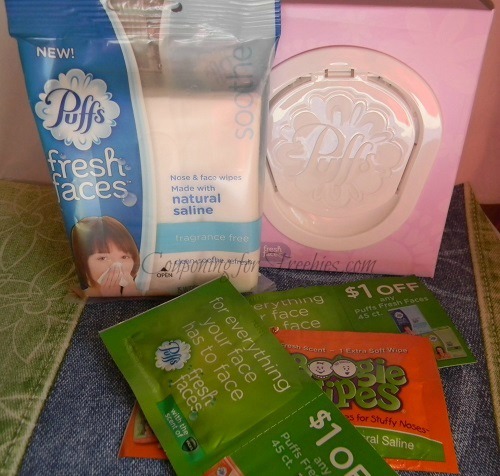 Have You Tried Puffs Fresh Faces or Boogie Wipes? With the end of the year getting ever more closer, the winter is just around the corner. With that comes the inevitable season of colds and flu. Its about this time of year, that a lot of people stock up on different cold remedies and tissues. I recently tried out a product that would be really effective when a deep cold sets in. The product, from Puffs is called FRESH FACES. It is a moist, but sturdy tissue for clearing your nasal passages when you have that cold that makes your nose so sore, it hurts just to touch it with a tissue. I also personally tried the children’s version of this called BOOGIE WIPES, also made by the Puffs company. I found that it can also double as a moist towelette to wipe your face. The moisture is a gentle saline solution to clean but did not irritate my skin. This particular version also had a grape scent added, obviously to make cleaning children’s noses a little more pleasant than a heavy medicine scent some other wipes have. I personally had never used a moist tissue before. But now I can see the distinct benefits of using something so non abrasive on a very sore nose. The clean feeling it leaves is definitely different from using a plain tissue. It is almost like you can clean your nose each time you blow. Also with some added moisturizers, it keeps the skin soft. Something we all need during the brutal winter months. Keep an eye out in your local store for this product. You may find small packages or samples to give it a try. You may also see some promotional coupons to give you a discount on your first package so you can see for yourself, what a nice product this would be to have, when the weather gets bad.